Welcome to the Spanish Valley Vineyards & Winery live webcam, featuring views of the tasting room, with Plush Kokopelli in the distance. Although it may look like nothing is happening, when guests arrive for wine tasting, you will see them in this frame. Moab, Utah. Enjoy! As the proud owners of Spanish Valley Vineyards & Winery, we blend our love of creating fine wines with our skills as artists and craftspeople in all that we do. Our artistry is expressed in the language of our wine, and with each bottle we add a little poetry. 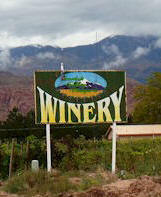 We invite you to experience the poetry of our finely-crafted estate wines grown in the heart of Moab's Red Rock Country: Gewurztraminer, Riesling and Cabernet Sauvignon, or one of our delightful non-estate specialties: Zinfandel, Syrah and Tempranillo. MoabWine.com is a member of the MoabLive.com network of websites. The mission of MoabLive.com is to increase the public's awareness of the beauty of national parks and national monuments in the West, and the preservation of unique landforms and enhancement of outdoor lifestyles. A complete listing of all domains owned by MoabLive.com may be accessed at the bottom of this page or the Links Page at Moablive.com.